An independent, full-service branding firm with over 2,300 clients across North America, Brand Champion is in the business of helping local businesses develop their own unique brand. Leveling the playing field with national “big box” companies is the passion that drives us. Working directly with business leaders, we deliver successful programs (often growing a business more than 30% in the first year) through strategic planning, message creation, plan deployment, and managed results tracking. Our unique value is our ability to touch a marketplace in a way that compels consumers to desire doing business with our clients. Brand Champion most often works with local retail and service businesses with sales of between half a million and twenty million dollars in sales. Many of these clients are dealer/franchise members of national companies like Saturn, Little Caesar’s, Napa Auto Parts, Harley Davidson, Chevrolet, Jiffy Lube, Pontiac, Ethan Allen, Hudson’s Classic Grill, and more. 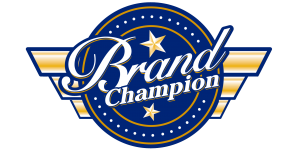 The Brand Champion staff has trained under Jack Trout, Roy H. Williams, Harry Beckwith, Seth Godin, and other legends of marketing. We help clients by teaching about branding as we develop the strategies, creative, and deployment plans. Brand Champion has a reputation for employing the rules and laws of marketing to transform businesses into wildly successful enterprises.